DSTRYRsg: Destroyer Submission Grappling and Brazilian Jiu Jitsu: THE AÇAÍ BOWL: The Grappling Competitor's Consolation Prize. 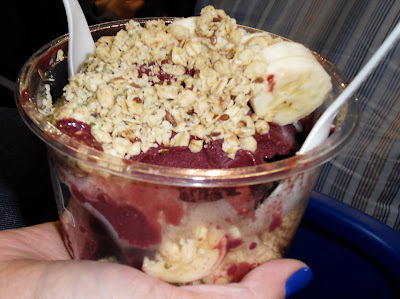 THE AÇAÍ BOWL: The Grappling Competitor's Consolation Prize. Damn. 2010 Pan Jiu Jitsu Tournament just came and went this past weekend. Hope you were there for the ride. Here's my story in 4 sentences: I hadn't competed in many years and this was my first time competing as a black belt (Senior 1 Division). I lost my first match 6-0 to John Carlquist (an Instructor at Unified Jiu Jitsu [Pedro Sauer Team], Salt Lake City, UT). Basically, I lost position mid-match after defending his armbar attempt from guard, re-gained guard position and then didn't pass. And that was it - John won Gold (easily winning his next 3 matches, including one submission) and I went home with no medal. You competed and won: That's awesome. Many congrats from DSTRYRsg. You competed and lost: Still awesome! You put it out there and now you have better intelligence on where you stand among your peers and what you need to do to get better at jiu jitz. That's what we all want, right? You didn't compete, but took a photo with Rickson Gracie to show to your grappling buddies: Well, not as good, but not bad either! He's both handsome and legendary. As we've said before (and many others do as well), the experience makes you stronger and happier too (if you are like me)! It's certainly a wonderful thing to be able test yourself against stronger and stronger opponents ALL THE TIME. LOL awesome :) I think I have footage of your match... will let you know when I get home! It was great to finally meet you in person. See you at Mundials!! Acai is awesome! I tried it in those fruit smootie bars in Rio and I swear it has magical recuperative powers. No one believes me, but as long as I believe it, that's what counts. Anyway, it takes guts to show up to the big dance if you haven't competed in a while. maybe I'll be there next year (or two). You are awesome Frank. I am truly inspired to get out there again. Bondo: Thanks, bro. Let's do it! HomeImprovementNinja: Thanks as well. Acai is delicious indeed; not sure about the magical effects but anything is possible in jiu jitsu. You can also shop for over-priced gis and training equipment at tournaments. Georgette: Great meeting you too. Wish we had some more time to hang. If you come out to SoCal again, come by and train with us. I actually have my full match on video and thought of posting it here - but, it's really not that thrilling to watch! Was good to see you get out there and go for it, the Pans and Mundials are a tough tournament to debut at black belt at (just ask Kron). I think the road to these tournaments is the thing that makes you better, the actual outcome is irrelevant.